Set to open in spring 2018, the Salesforce Transbay Transit Center in San Francisco is a completely reimagined, state-of-the-art transportation hub built to inspire. The transit center, wrapped in a flowing white metal veil, will connect the city to eight Bay Area counties with a planned high-speed rail line to Los Angeles. It is a stunning example of how fabrication can inspire the transformation of a whole neighborhood. But such a transformation doesn’t just happen—this project’s cutting-edge design required equally precise fabrication solutions from Mate Tooling. Designed by Pelli Clarke Pelli Architects, the Salesforce Transbay Transit center features a curving exterior aluminum screen that wraps the four-block structure. The innovative screen uses a groundbreaking geometric pattern known as “Penrose Tiling” to let in air and natural light. The screen design is based on an algorithm discovered in 1974 by Sir Roger Penrose that can extend the pattern infinitely without repeating itself. 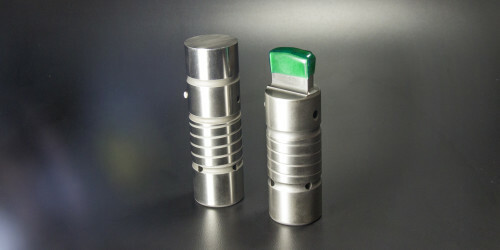 Customers have long respected Mate’s high-quality precision tooling and services. That’s why project engineering firm Architectural Systems turned to Mate to help create the nearly 5,000 conjoined panels covering the structure. With an average size of 65 by 72 inches, the ¼ inch panels were punched using Mate’s diamond cluster forming tooling on Murata Wiedemann 4560 turret presses. The complex hole pattern required an angular orientation to create visual symmetry. With 37% of the panel surface area open, each hole required a smooth, burr-free edge so the paint could dry smoothly. Graves also praised the diamond cluster tool’s extreme degree of orientation accuracy. He noted that Mate’s engineering expertise in the design of the rooftop shear face of the punch allowed them to meet the dual challenges of meeting the required angular orientation of the panel perforations and creating visual symmetry. This was accomplished while exceeding design expectations on the project. Now that’s inspirational.